Yeah, but: Foolish consistency is the hobgoblin of little minds. 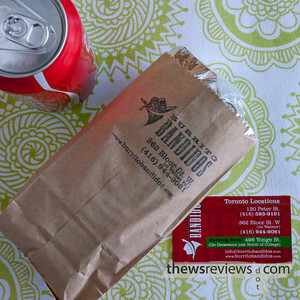 The Long Version: I'll start this review backwards - the biggest problem with Burrito Bandidos is that the ordering can be hit-or-miss. In the interest of speed, they like to ask for all of the information up front, and as a customer, I'm asked to tell them what I don't want on each burrito. Ordering one is easy enough, but the error rate for my typical two-burrito order can be as high as 20% - about one out of every five has something wrong with it. They're far from being as challenged as Hero Burger, where I no longer think it's worth the effort of getting food, but if Burrito Bandidos can boost their accuracy I'd easily give them a '3' for Execution, and even consider a score of '4'. That's almost stratospheric around here, but they certainly have that potential. 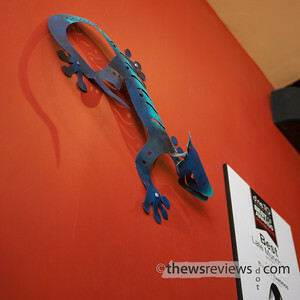 It's hard to break the $10 barrier with a burrito and a beverage, and the quality is very good. The steak uses real steak, and I've never stood there and thought 'I hope they don't use that tomato…' the way I can with some of the submarine sandwich shops in the neighbourhood. I used to go to the original location on Peter Street, back when it was still operating under the inferior Burrito Boyz name, and I think the Burrito Bandidos' Annex location does a better job. Aside from the occasional random ingredient, or random lack of an ingredient, I have no complaints. They've become my preferred replacement for Cora's Pizza, and I usually end up with a burrito about once a week. 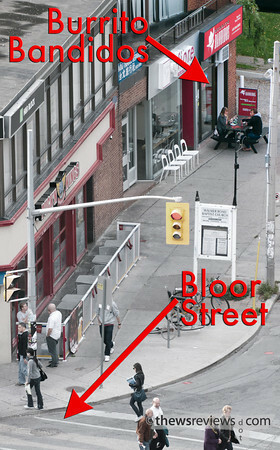 The Annex location has a deceptive address. Officially at 362 Bloor Street West, it faces onto Walmer Road and is at the far end of the building, so you'll never find it by walking along Bloor. It's just across the street and a little south of the Walmer Road exit from Spadina Station, which in turn is behind the Shopper's Drug Mart. It's easy enough to find if you know where to look, and it's one of those places that will always get repeat visits.